Hawker Fare is one of the new hot shots on the food scene with their brick and mortar locations in Oakland and a new one in San Francisco that's gotten lots of raves. They do Thai food and not having eaten there yet, it seemed a good place to start. 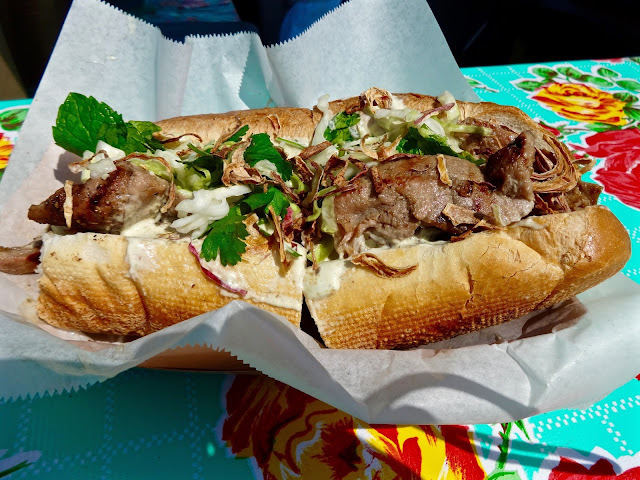 This is the moo yang--bbq pork shoulder marinated in whisky, white pepper, coriander root, garlic and nam jim jaew on a toasted French roll with mayo based spicy mint cole slaw and crispy fried red onions. Well, it was a good way to start and a lot bigger than I thought it'd be. I was thinking light bite to start, but we went with it anyway and it was quite delicious. Meat could have been a little warmer but otherwise, this was very tasty and a winner for both the SO and me. I'm really interested to try their restaurant now even though I'm not the biggest fan of Thai food. There were a lot of Mexican food things to choose from and oddly I'd had most of them. I searched out a new one and landed at D'maize. Fortunately most booths only had 2 or 3 options which made it easier to choose for me. 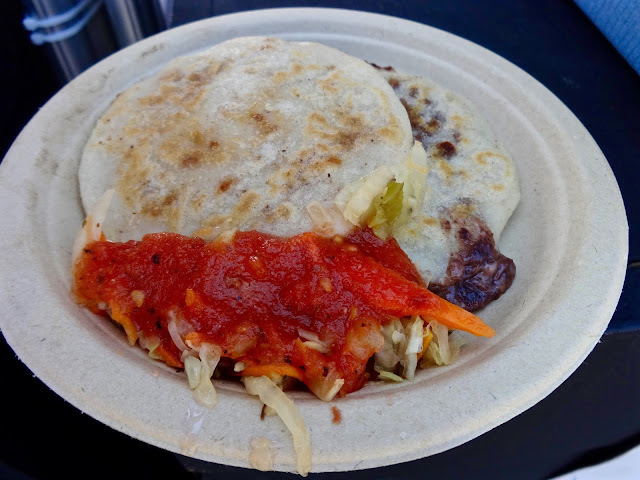 I got one each of their papusas--bean and cheese and pork and cheese. They were okay though a little too soft and mushy like the dough wasn't completely done. I've had other papusa in town and liked them as the outside had a little more texture and doneness. The sauce could have been spicier too. 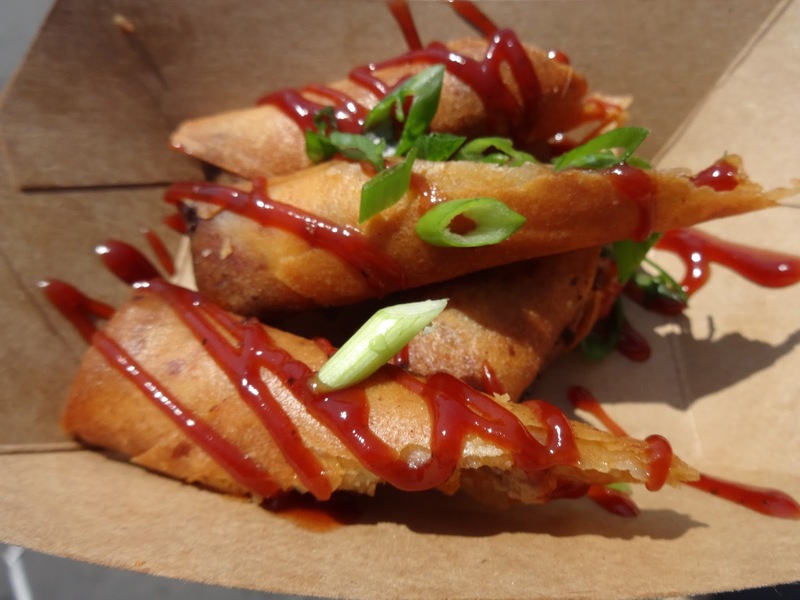 I guess if you are at a food fair you gotta have something deep fried so I hit up The Lumpia Company for a bacon cheeseburger lumpia. They did taste like little crispy cheeseburgers but any bacon flavor was totally missing. Might have been nice to have that added smoky flavor. The sweet sauce was a bit of a drawback too. I'll give these and okay, though, more bacon would have really kick it up. From Southeast Asian food we made a beeline for some Middle East fare at Reem's. Here we have the classic man'oushe--a wild thyme flatbread with cherry tomatoes, cucumbers, mint and their signature za'atar--a spread combo of thyme, sumac berry and sesame blended with olive oil. Hate to talk bad about something, me and the SO did not like this at all. The spices were just way overpowering and it was too salty. Once they rolled this up, the spread was layered on top of itself and quite pungent. Maybe if it had been served like a pizza and open faced or something, but as is, we couldn't get through more than a bite each. Fortunately for Reem's, this wasn't the only dish we got from them. Mahalabiya--cardamom, rosewater and orange blossom milk custard with pistachio. This was a perfectly cooling and refreshing dessert on a hot day that wasn't too sweet. 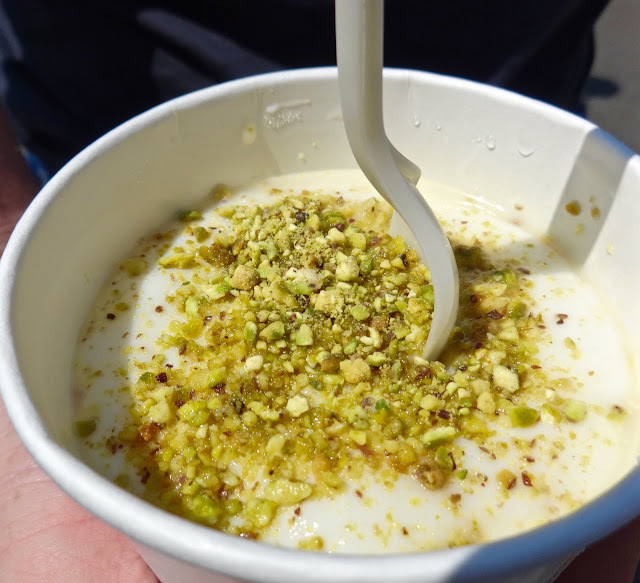 I'm not the biggest custard or rosewater fan but could appreciate it the flavors here. The SO was a huge fan thus our journey to the Middle East wasn't all bad. Not my best picture, think by this point I was beginning on the food sweats, wait, it was 90 f'ing degrees, we were just sweating in general. 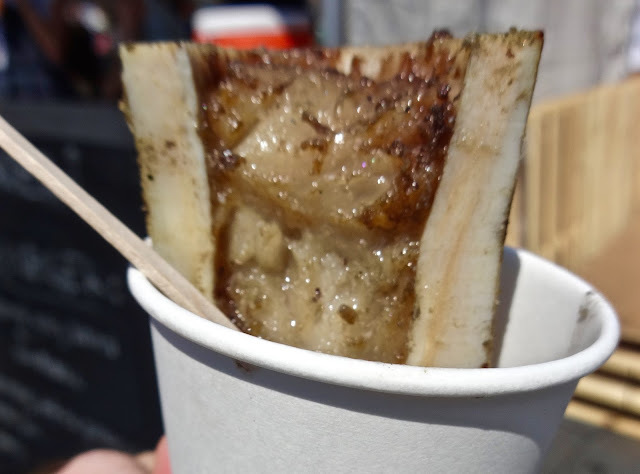 If you can't tell, this is bone marrow from Kronnerburger. They used to do pop-ups at The Mill before getting their own brick and mortar location in Oakland. I know they have many fans, though I wasn't the biggest supporter of their burger. I was interested in trying the bone marrow which I missed out on last time. Fortunately it is a small serving because this really is all fat and very rich. The salty, beefy flavor goes down easy but texture wise it's like a very soft gel which for some may not be appealing, thus small doses of this work best. Next us was Hawaiian inspired pop-up Aina with their house-made spam musubi--a chunk of seared spam with kimchi, sticky rice, seaweed wrap and lettuce. 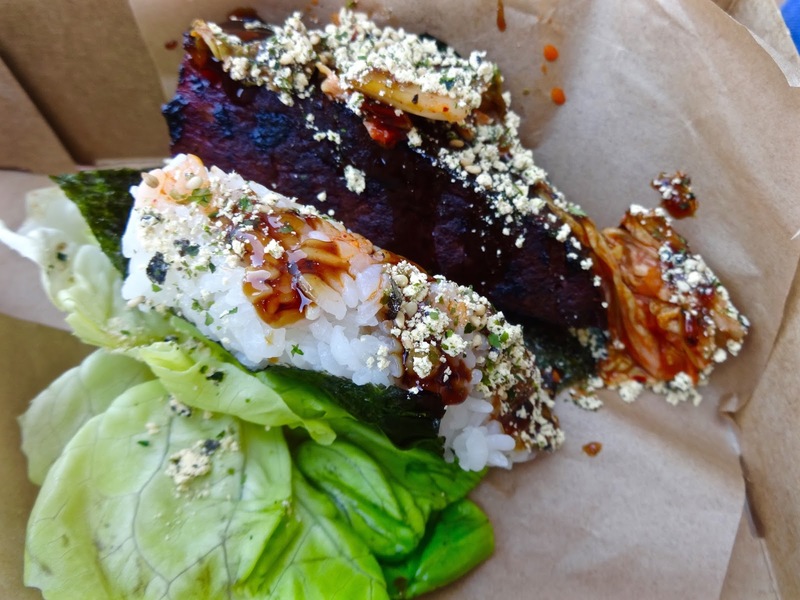 The first thing that came to my taste buds upon my initial bites was salty, salty, salty--then that fishy seaweed. Totally not my cup of tea as it were. And the kimchi didn't offer up the spicy punch I was expecting either. The SO, who's more the sushi fan was only iffy on this. The pop-up brunch menu looks more interesting than this dish ultimately was. Let's hope it is also less salty. The second offering from Aina was a malasada with a coconut guava cream filling. 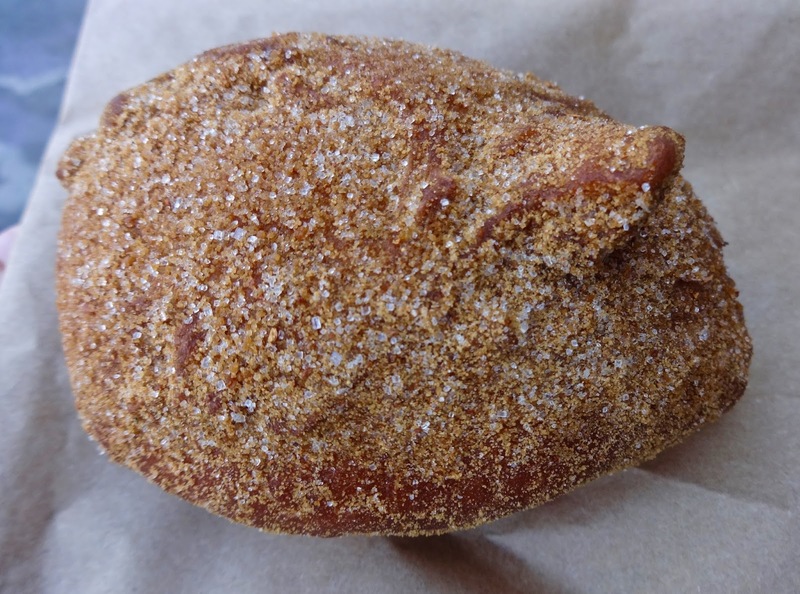 Malasadas are more Portuguese than Hawaiian and are basically deep fried balls of yeast dough covered in sugar. I guess the filling was island inspired. The donut part of this was nice, light and airy yet still with enough heft to be a filling dessert. The cream filling, however, didn't work. Really couldn't taste any coconut plus they were squirting the cream in these as they were ordered and maybe the dough was too hot but when we opened this up the cream seemed to have separated into it's component parts like it had curdled, which made it even more unappealing. Maybe the cream should have just been served cold as a side to dip in. Donut 1 cream filling 0. We finished off this round of dining by going full off the grid and some Laotian cuisine from Lanxang Kingdom. 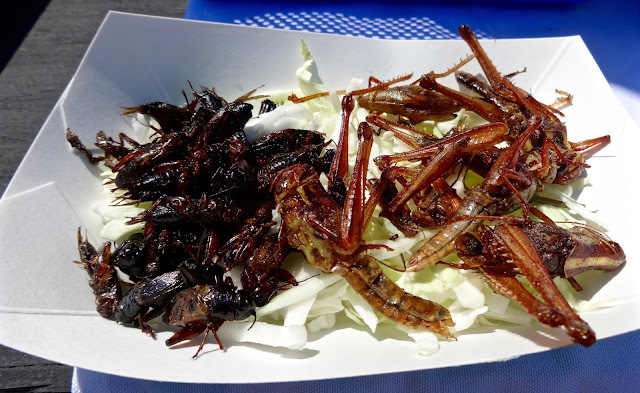 That's right, we went totally back to nature Bear Grylls style with some deep fried crickets and grasshoppers. No fancy breading here, just a dash of some light seasoning and a splash of soy sauce and a flash fry. Yum, yum crunchy right? Basically what you get here is just crunchy exoskeleton, kind of like the skin bits left over from popping corn. The seasoning was bit too salty for us. Plus, I wished they'd have served it on something besides dry cabbage. If that was a slaw instead I think it could have raised this about just the novelty of deep fried bugs. 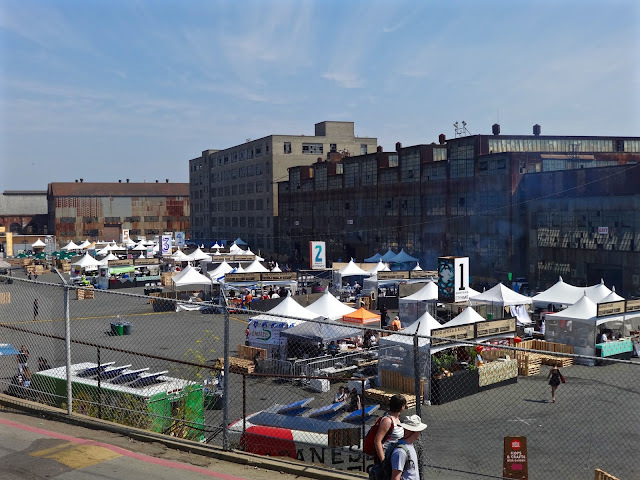 And there it is, part one of my rundown of food from the San Francisco Street Food Festival. I think that is 9 dishes down and 8 or 9 more to go. Like I said, we ate a lot. I think even at one point the SO said "I'm full." I know, I was surprised too. Funny the way heat can affect a person. Though it didn't make us delirious enough to stop our foraging. Till next time.